Can Annette Obrestad Win Her First WPT Title? A very familiar name will enter Day 5 of the WPT Festa al Lago main event with the tournament chip lead, as Annette "Annette_15" Obrestad managed to finish Day 4 with over 2 million in chips. Annette Obrestad has already won a number of major tournaments over the course of her career, despite the fact that she is just 22 years of age. In 2007, Obrestad shocked the poker world by taking down the World Series of Poker Europe main event for just over $2 million USD. Obrestad, who had made her name online playing under the "Annette_15" alias, had now officially arrived on the "live" tournament circuit as well. 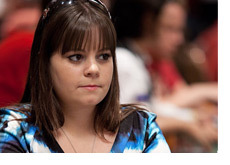 During the course of her career, Annette Obrestad has over $3.4 million in live tournament cashes. A win in the WPT Festa al Lago main event would move Obrestad into a virtual tie with Annie Duke for second place on the all-time women's money list. All of the remaining 13 players in the event are guaranteed a minimum of $32,240 for making it this far. The eventual winner of the event will walk away with over $830k in cash and a $25k seat to the WPT Championship, while the runner-up will take home $564,200. Day 5 of the WPT Festa al Lago main event will get underway at 12 pm local time on Tuesday afternoon, where the remaining 13 players will play down to the TV final table.